This is my second visit to craftbar. I've been meaning to go back for some time now, as it's the perfect place to go with a bunch of friends for great contemporary Italian food without having to spend as much as you would at his flagship restaurant, Craft. 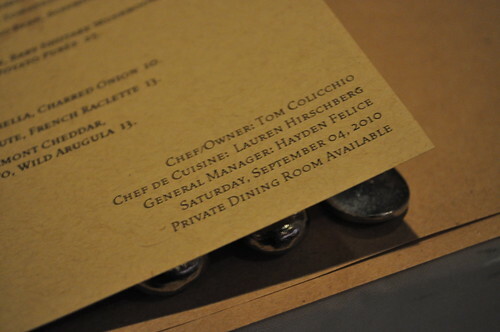 Plus, reservations aren't too hard to get at the last minute! Also, it was nice to be able to get a photo of the restaurant's banner outside, as the scaffolding that was there a few years ago has finally been squared away. 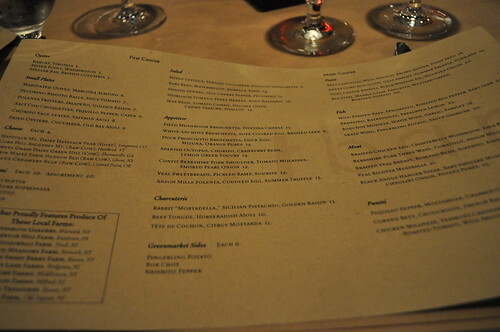 Menu at craftbar. Nice watermark. VIPs at craftbar, plus "date" indicating the daily-nature of its menu. 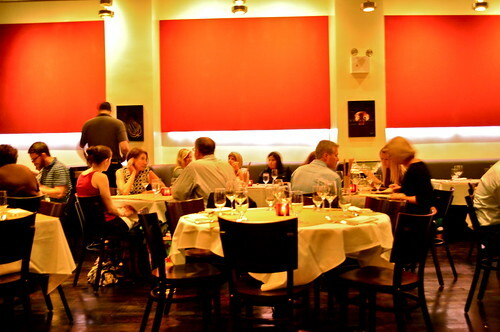 Inside craftbar. Very modern and minimalist décor. I particularly admire the framed photograph of a mushroom on the right pillar. 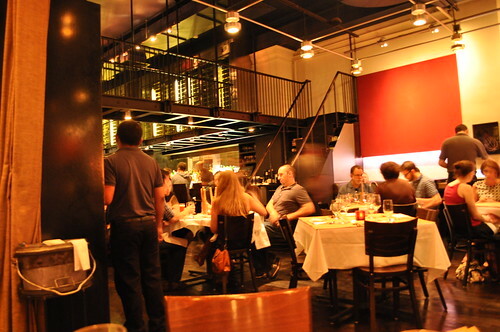 View of wine cellar inside craftbar. 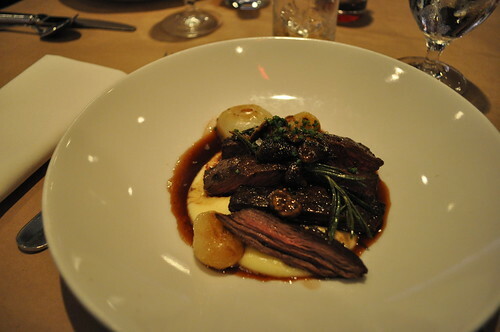 Marcus ordered the Black Angus hanger steak with baby shiitake mushroom, market onion, and potato purée. Marcus said it was very good, except the portion was a little on the smaller side. I need to remember to steal a bite of the other dishes ordered during meals I plan to blog about! On a lighter note, I do like the simplicity of its presentation. 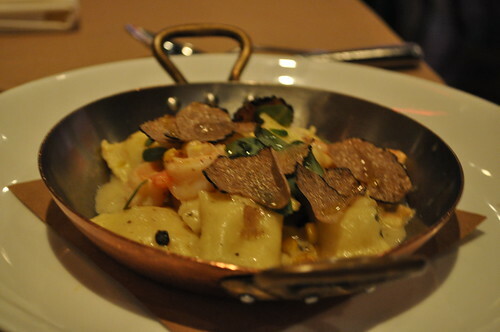 Krystal and Ariana each had the sweet corn agnolotti with Gulf shrimp, summer truffle, and purslane, similar to the agnolotti that Linda ordered at Maialino. I remembered to try a bite of it, and it was nearly on par with Maialino's sweet corn agnolotti (maybe close to second best than tied with). The notable differences was this was slightly creamier and softer (less al dente). Nevertheless, a great dish to bid summer a nice ode and farewell. I had one of the specials offered that day, which I had our waiter repeat so I could jot it down quickly: housemade tortelloni with lobster meat, sofrito (sweet onions, celery and fennel) and a ragù of lobster, mushrooms, and pearl onions. The kitchen finished making it a couple hours before we had arrived for dinner, so it was fresh for that day, and boy, could you taste the homemade-nature of that pasta! Marcus couldn't resist ordering dessert, as one of the offerings contained his favorite flavor of ice cream. 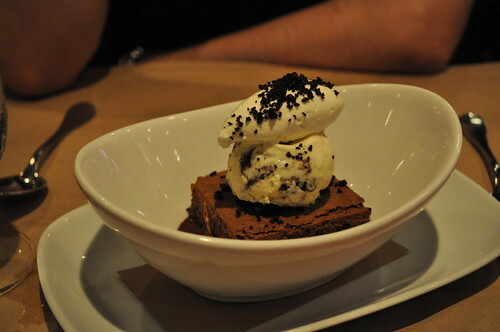 He went with the warm brownie with chocolate sauce, whipped cream, and cookies & cream ice cream. Can't go wrong with a warm brownie a la mode! 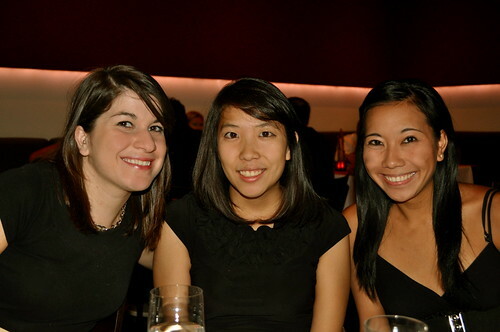 Ariana, me, and Krystal at craftbar taken by Marcus, who was a little, if not always, camera-shy. 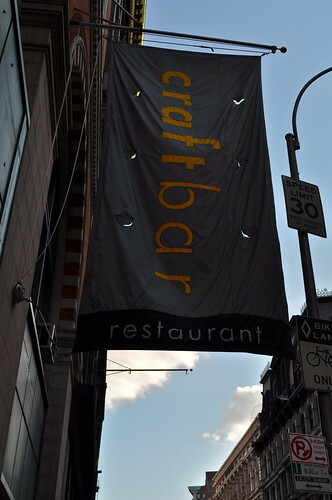 Findings: I find craftbar to be a very reliable place to go with friends or take out-of-town visitors as the price point isn't too steep, the ambiance very casual elegant (and trendy), and the food is very solid, contemporary Italian cuisine. 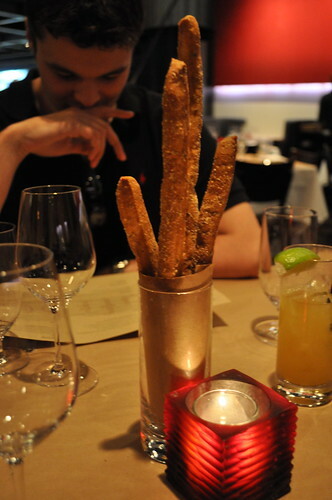 For a celebrity chef's restaurant, I didn't find craftbar to be "tourist-y" or overhyped. Rather, I found it to be very understated modern that you wouldn't really know it was an Italian somewhat tapas-style restaurant, much in contrast to the more traditional, overly elaborate Italian décor seen in restaurants lining the streets of Little Italy. 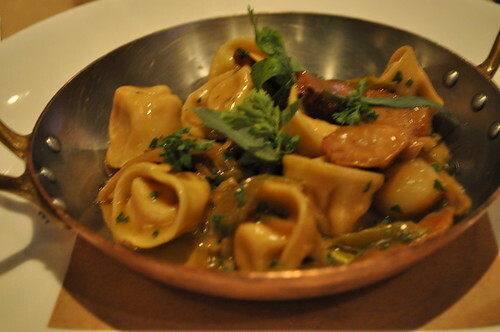 I recommend ordering from its list of the current day's specials (most, if not all, are made inhouse that day) or having the seasonal agnolotti (in our case, it was filled with sweet corn for the end of summer). During my last visit, I had the pecorino fondue with hazelnuts, which was mindblowing in taste. Sadly, I didn't see it on the menu this time around, but definitely keep an eye out for it in case you plan a visit to craftbar. Price point: $23-29 for each entrée; $10 for dessert.